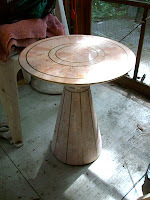 I've been commissioned to cover this little stone table (yes, it's solid stone - very heavy!) with mosaic. The client had a sack full of broken mugs and dishes that she wanted to use for the project, which I have happily shattered with a hammer (very therapeutic!) 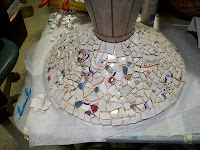 and then had to further cut into small pieces with the tile nippers. I say small, but I should have said tiny; because the pieces are curved, they need to be cut into very small pieces if they are going to lay - sort-of - flat on the table. Grout, of course, is the great leveler. Here you see the table "before" and again after the underside of the top was finished (before grouting). Now I will flip the table back upright, put the top on (which I created earlier on mesh) and finish the sides. It's a wonderful way to get back in the game, because my client did not want any sort of recognizable design, so it is easy to just nip and stick any which way.